I had ordered for myself the salted-roasted in the shell, but got the regular-roasted, ate them anyway, still very good, but was disappointed that they didn't get the order right, and will wonder what they will send to the people I sent some to for Christmas. I will order from them again. Peanuts tasted fresh, but not salty enough . wonder when harvest is the freshest ? Owner Response:Sorry to hear that you did not think the peanuts were salty enough! We'll be in touch soon regarding our 100% guarantee. THE BAGS THAT THE P-NUTS ARE SHIPPED IN SMELL LIKE DDT OR SOME CHEMICAL FOR KILLING PESTS AROUND THE HOUSE. Owner Response:We think what you smell is the paint used to screen print the company name, etc. on the bags. We can assure you that the bags are not treated with any chemicals. We will be in touch regarding our 100% guarantee. I sent these to family members across the US & everyone loved them. This year I sent myself some and I AGREE! Fresh & tasty and a great gift idea. Best roasted peanuts around and everything was shipped.fast and correctly. I order them every year and will definitely continue! The peanuts came in a very timely manner and they are delicious. Thank you for great service and amazing peanuts!!! Very good peanuts. And we love the canvas outer bags too! Fast delivery. These peanuts are fantastic! The crunch is satisfying. The roast is perfect. The taste is excellent. And, just the right ammount of salt. Good taste, decent size. Love the burlap bag. Excellent peanuts met all expectations. The only negative aspect in the transaction was that the postage was almost equal to the purchase price of the peanuts. I thought I ordered JUMBO what I got was small!!! They are fresh and good but very small! I know what JUMBO looks like as I have purchased them before. I will not order them from Bertie Peanuts again. Remember, they are very tasty but small. I was happy with the delivery and appearance of the peanut order. The taste was superb, with just the right amount of salt. The only disappointing fact about the basket of nuts is y that there were very few 4 nut peanuts...mostly 2 nut shells with a good sprinkling of 3 nut shells, but very few 4 nut peanuts. Maybe that's just the way the cookie (er...peanut) crumbles. Love these. I don't know why the hippies around here don't buy or sell salted peanuts, but sure glad that Bertie County does, and ships them to my door! Peanuts great as always never fail as Christmas presents best part is they get used all up. Ordered for my husband for valentines day... Cool packaging and peanuts fresh and delicious !!! Staff was helpful and received prior to estimated deliver! I will order again! Excellent, big hit at our family reunion; fresh, crisp, tasty roasted peanuts, we could not stop eating...thank you! Found everything to be in place as promised. Owner Response:Sorry to hear you did not like our lightly roasted and lightly salted roasted peanuts. We try to hit the happy medium as everyone has different taste preferences. But, thanks for letting us know about your preferences. Truly the best flavored in-shell peanuts anywhere. Highly recommended! Of the three types of roasted peanuts ordered, we have tasted only the salty variety. Our order, placed early in late Nov., was full-flavored and delicious. When we open the plain and the spicy-hot bags I will report on their tastes. Incidentally, from an aesthetic point of view, the burlap bags are adorable! They add a wonderful, exciting touch, even better than expected from the photos online. I will keep the bags for "rustic" decoration in the kitchen. I will put them to good use permanently. Thank you for an extremely quality product! The peanuts really tasted good! Amazing peanuts that you can't stop eating!!!!!!!!!! It's all about the nuts, every year. I have been purchasing salted shelled peanuts over 10 years now, about the same time too. I can't remember anytime that I have been disappointed and neither have the family and friends that I have given these burlap bags of peanuts too. I swear I tell them every year how to get them and the card in the bag shows the way. But they wait for me. So here it is that time again. It's a gift that keeps on giving, until the bag is empty. Happy holidays. SHIPPING IS WAY TOO HIGH!! $11.00 for a $16 item---RIDICULOUS! Great product, great packaging. Arrived four days ahead of projected arrival date. That is good. I was real satisfied with the taste of the Salted Roasted in the shell peanuts. They were fresh fresh fresh. The salt level was not to heavy. I sent a box of salted in shell peanuts to my father as a gift. He enjoyed them immensely and said his friends thought they were the best they had ever eaten. I will be buying more. Service, prices, delivery all very Good! I was a little disappointed that the 2 lb bag of roasted-salted were of smaller size than I usually get in the 25 lb bulk; also, noticed more empty and partial shells than usual this time. Still, overall Very Good! What can I say but "excellent". Fresh as always. I've tried them before from a friend and could not believe how fresh they were. They were habit forming. I ordered them online as soon as I got home. Try them, you won't be sorry. I bought peanuts for my husband's birthday because my friend had some. My friend's peanuts looked and tasted sooo good. However, the peanuts we got were very disappointing. Owner Response:We're sorry to hear the peanuts did not meet our expectations. We will be shipping you a new bag just as soon as possible. Thanks for letting us know. I ordered these for a friend on his 75th birthday. He said they are good size and very tasty, and that I am ordering from a good company. The peanuts where fresh when they arrived and very tasty!! Very tasty! Great customer service as usual. Extremely disappointed. The shells had some flavor but the nuts inside none. Just tossed the 3/4 of the uneaten sack. Sad that supermarket nuts had more flavor. Won't be ordering again. Owner Response:We're sorry you did not like our peanuts. We'll be in touch regarding our 100% guarantee. I have been giving these 2lb bags of salted roasted peanuts to my kids for Christmas for the past 4 years. They will be upset if I do not keep this tradition going. they love them, I love them, they are simply the best. I grew up in Bertie County and my Dad was a farmer who grew peanuts for years. 36 years later the same Bertie County peanuts taste just as good. I gave 4 bags to my co- workers at Goodyear Tire Co..They will be placing orders. Peanuts were a hit with my sisters family! Ordered 10 pnds of peanuts for my sisters family in AZ and they are devouring them as we speak! They loved them. Thanks so much for the prompt delivery and great product! Wasn't sure what to expect when I ordered the 6lb of peanuts in the shell but I'm glad I did. The product is fresh and I shared with everyone on Christmas day. Very good product, as advertised and arrived on time. I will be ordering from Bertie County Peanuts, again. Fresh and tasty!!! Bought 12 lbs of peanuts for decorating and snacks at our daughters baby shower to Welcome Little Peanut!!! Awesome product, fast shipping and good packing! The best Salted in the shell peanuts I have found! Love these for a late night snack. Best peanuts I've ever had. Perfectly salted. I have ordered peanuts from your company for over 10 years. I did receive a box this time where I don't think the peanut were as fresh as I was expecting. Your delicious nuts have made us s bit spoiled. For some reason, these peanuts in the shell seemed a little older. I have always expected and received a great level of quality in all of your products. This time, my dad, son and I were a bit disappointed with our order. Every year we get my Grandpa the salted peanuts in the shell. Always delivered promptly, fresh and delicious! My grandpa is 93 and thinks these are the best peanuts around. The roasted peanuts are always fresh and perfectly roasted! My favorite - brings back childhood memories growing up in Bertie! Love the roasted, salted peanuts! Will be ordering again! Very pleased with product and very, very please with service. Was a hit at the wedding. I send these to my Dad in Texas. He loves them! Easy ordering, shipped fast, great packaging and product! Highly recommend! love these roasted in the shell. Been ordering from you for several years now. Grocery stores have Georgia pnuts but not nearly as good as Bertie County Pnuts. Continue shipping great fresh peanuts and I'll continue to buy them. It's as simple as that. The flavor was not as good and they were too hard. every year I order peanuts. This year I ordered two boxes of baged roasted / Salted peanuts to hand out for the holiday. I live 1/2 way across the country and it was maybe 3 days and the peanuts arrived. I ordered twice as many this year because of the because of the positive feed back from the people that got some last year. Those positive feed backs were also hints. I have been ordering these peanuts for a few years. We have one of the oldest, most reputable nut purveyors in the USA locally available, but hands down these are THE BEST. No question about it. Shipping is reasonable and quick to the Midwest. Definitely worth the effort to source from BCP. The peanuts taste amazing! It would be better if they were packaged in smaller sealed bags. They will probably go stale before we eat them all. 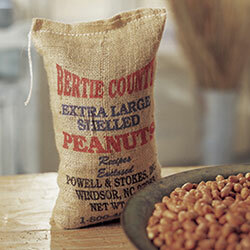 Bertie County peanuts in the shell are consistently fresh and delicious! Same as I do everyear, the holiday season is nuts so why not go nuts and buy some. Getting more expensive but it's once a year, never disapoints and the gift never sits on the shelf. there's wayy too many empty shells, jus to get to the peanunt...they don't taste any betta than the HInes lb pkgs I get at HEB..so I'll be sticking w HEB..not too mention that 11.00 ship price, yeah not diggin that, for sure. Owner Response:We're sorry we failed to meet your expectations. We'll be in touch. Bought the 10lb basket of salted peanuts for our office and everyone loves them! We are half way through the 10lbs in one week!! Best peanuts we have ever had!!! The peanuts are very delicious! They were shipped safely and in time. Thank you! Loved the peanuts that we used both to eat and decorate for a party. Very Fresh, delivered on time and delicious. These are the best salted in-shell roasted peanuts. I enjoy raw or unsalted, but my wife loves these salty ones. She says that they are the best she's ever tasted. Enough said. I was very satisfied with my order. These r the best peanuts that i have ever taste. I would recommended your company to my friends and neighbors. ....but as usual I return when I need a good peanut fix. Price and shipping a bit more than I would like to pay, but it has not stopped me yet. I received my package in a timely manner. I was thrilled with the quality and freshness of the peanuts I received! We ALWAYS buy a stack of Bertie County goodies for Christmas gifts. Our friends expect them and we wouldn't want to disappoint them. We get fast efficient service and always great quality. Just received my first shipment of your product! Box that products ships in is first class, thanks for spending the extra money on that product. Your Salted in Shell peanuts are Great! Bought some at a gas station on a trip years ago to the Taladega Raceway at a gas station and could not believe how great they tasted! Thanks! Only the best roasted peanuts I've ever had. I'd swear they were so fresh they should have been WARM!!! Order came fast,well packed and really fresh. Fantastic customer service and outstanding products! Bertie County pnuts are, quite simply, the best nuts you'll ever cram into your face. Get you some! Have ordered as usual at this time of year. Always look foward to Bertie County Peanuts as do the recipients. It IS for the dogs. My old Chihuahua needs medicine 3x a day and he will ONLY take it if I first chew your peanuts then hide the pill in that. The whole family is nuts for your nuts. 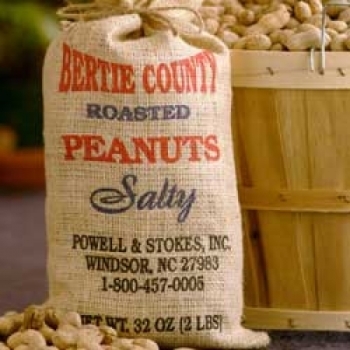 Bertie County Peanuts are fresh tasting with the right amount of salt. And since they are grown right here in North Carolina, that makes them taste even better. Deeee-licious My Dad was a goober guy from Alabama. I wish I had known about these when He was still here. He would have loved the nuts and especially the gunnysacks they come in!! Absolutely the best peanuts I have had. Not too salty. Not too crispy. The peanut is tasty. Price? These peanuts are the best I've eaten. Just the right amount of salt and perfectly roasted. The order came in the time it said it would, and they were great. The neighbors loved them, and so did we! Awesome shelled peanuts. Just the right amount of salt, not to much, not to little. Good snack for watching movies. I've ordered from Bertie several times now. There is nothing like a perfectly fresh, lightly salted and roasted peanut. Awesomeness. P.S. the hot peanuts are great too!